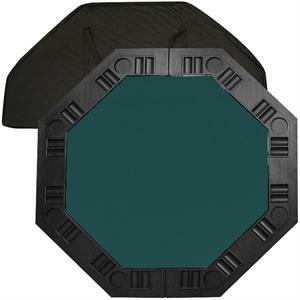 It is an 8 player position poker table complete with individual trays for poker chips and a drink holder. It also comes with a handy carrying case and a molded handle on the table for easy pull-out. The best thing about this table top is its convenience. It is very easy to travel with as it fits into the trunk of a car or the back seat. It’s not very heavy for travel but it is solid enough for durable use. Folding the table in half reduces the size to about 2 feet by 4 feet for easy storage in a closet or under a bed. Product measures 48.5 x 48.5 x .625 with a 37.25 inch diameter octagonal felt playing surface surrounded by molded plastic cupholders and chip tray perimeter.